One E-mail A Week Is All You Need! Week 4 of the college football season saw Big Ten conference play get underway with four games on the schedule, and for the most part there were no shocking results. Nebraska and Michigan both won SU and ATS, while Iowa was able to squeak by Rutgers, failing to cover the 14-point spread. Wisconsin put everyone on notice that they are for real this year after soundly beating Michigan State 30-6 as a five-point underdog. There were also three nonconference games on the card involving Purdue, Minnesota and Indiana. Both Purdue and Minnesota won SU, but it was the Boilermakers who were the only team to cover the spread. Week 4 in the Big Ten sees seven conference games on the card, with the most intriguing matchup taking place in Ann Arbor, Michigan, between the No.8 Wisconsin Badgers and the No.4 Michigan Wolverines. The schedule makers certainly did the Badgers no favors this season. This is their second consecutive road game and already their third game against a Top-5 team. The fourth such game will come next week against Ohio State. Should Wisconsin find a way to get the job done this week against Michigan, they will be in prime position to win the Big Ten West division and would likely have to beat Ohio State in the Big Ten Championship Game to have a shot at the College Football Playoff. 1. 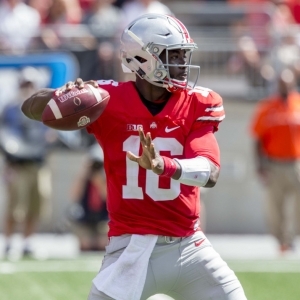 Ohio State Buckeyes - The Buckeyes had a bye week last week and now must face a pesky Rutgers team at home. Barring an upset of epic proportions, the Buckeyes should maintain this position for the foreseeable future. 2. Michigan Wolverines - The Wolverines took care of a lifeless Penn State Squad by racking up 326 yards rushing and five touchdowns from five different players. They key to this week's game against Wisconsin is how the running game fares against a formidable run defense. 3. Wisconsin Badgers - The Badgers made Michigan State look very average last week. They were able to run and pass the ball well, which kept the Spartans defense honest and on their heels. They also won the time of possession battle, which kept the MSU offense off the field -- that will be another critical battle when they take on Michigan. 4. Nebraska Cornhuskers - Cornhuskers' QB Tommy Armstrong was strongly criticized last year for his lack of poise and careless mistakes. This year, however, Armstrong is the catalyst in an offense that has very few weapons. He has rushed for 227 yards in the last two games and has the Husker's at 4-0, ranked No.15 in the nation. 5. Iowa Hawkeyes - The fall from grace hurt when the Hawkeyes lost to North Dakota State two weeks ago. This past week, they almost lost to Rutgers. That tells me there is some serious talent missing. Despite being 1-0 in the conference, they should be nowhere near contention for a Big Ten title. 6. Minnesota Golden Gophers - The Golden Gophers enter conference play with a 3-0 record after beating the likes of Colorado, Indiana State and Oregon State. They now take their high-powered rushing attack (228-yards per game) to Happy Valley and take on a Penn State team who was just gashed for 326 yards rushing. These Gophers might be underrated. 7. Michigan State Spartans - Two weeks ago, the win versus Notre Dame looked great. After last week and Notre Dame's loss to Duke, that win looks less prolific. Combine that with a humbling defeat to Wisconsin and the Spartans are already behind the eight ball in conference play. 8. Maryland Terrapins - The Terrapins had last week off to reflect on their 3-0 start. The schedule has been rather straight forward up until now, but the start of conference play should test them. They have yet to commit a turnover and get to play a Purdue team that just snuck past Nevada. They should keep their win column at 0 after this week. 9. Rutgers Scarlet Knights - Rutgers is 2-2 on the season, and their two losses came against Top-15 teams. They held Iowa in check for most of last week but just couldn't find a way to win the game. They will probably get lambasted by Ohio State this week, but they are in a better position than Penn State and Indiana. 10. Indiana Hoosiers - I think Indiana's loss to Wake Forest is inexcusable. But I also think they had a better showing than Penn State did against Michigan, which is why I have Indiana in this spot. They have a solid shot at knocking off MSU in this week's matchup, but that will only happen if QB Richard Lagow takes better care of the football (five turnovers last week). 11. Purdue Boilermakers - The Boilermakers got a huge win last week against a pesky Nevada Squad. That win almost certainly saved Darrell Hazell's job. Now, the Boilermakers are looking to start 3-1 for the first time and must find a way to stop Maryland's high-tempo offense. 12. Penn State Nittany Lions - These Lions are ravaged by injuries and just had one of the worst showings I've seen this year. They were beat physically and mentally by Michigan, and I don't see how they come out of that game with any positives or momentum. I will be on Minnesota this week. 13. Northwestern Wildcats - A solid win at Duke was followed up by a shaky home loss to Nebraska. The Wildcats are in for a lot of unexpected disappointment this year, and that is unfortunate for a team that I like to cheer for. They are off this week, but they get Iowa in Week 6, which means another loss is imminent. 14. Illinois Fighting Illini - After being embarrassed by North Carolina and Western Michigan in back-to-back weeks, the Illini had last week off to regroup and refocus. Unfortunately for Lovie Smith, this team is not that talented and will be hard-pressed to win two conference games. The Wolverines are great at running the ball. They average 230 yards per game on the ground, and just last week they put up 326 and five rushing touchdowns. The offensive line is one of the greatest strengths of this team, and they have played exceptionally well thus far. They are an experienced group, with four of last year's starters returning this year. On the flip side, Wisconsin's front seven has been playing lights out all season long. They are allowing only 80.5 rushing yards per game, and their linebackers, led by Jack Cichy and T.J Watt, are forcing turnovers and playing much better than was expected. Watt leads the team with 4.5 sacks, and his 18 tackles rank second on the team behind Cichy. Wisconsin ranks seventh nationally in scoring defense (11.8 points per game) and 12th in total defense (277 yards per game). As is the case in most football games, the battle in the trenches are usually where they are either won or lost. If Michigan's O-Line can impose their will and create holes for the speedy RBs, then Wisconsin will have a tough time trying to contain a Wolverines offense that is averaging 52 points per game. © 2019 Doc's Sports Service. All Rights Reserved.